The Mambo Kings Play Songs of Love is a Pulitzer Prize-winning contemporary American classic, a book that still captivates and inspires readers twenty years after its first publication. 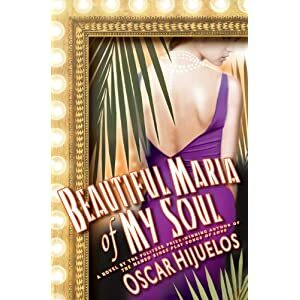 Now, in Beautiful Maria of My Soul, Oscar Hijuelos returns to this indelible story, to tell it from the point of view of its beloved heroine, Maria. She's the great Cuban beauty who stole musician Nestor Castillo's heart and broke it, inspiring him to write the Mambo Kings' biggest hit, ''Beautiful Maria of My Soul.'' Now in her sixties and living in Miami with her pediatrician daughter, Teresa, Maria remains a beauty, still capable of turning heads. But she has never forgotten Nestor, and as she thinks back to her days--and nights--in Havana, an entirely new perspective on the Mambo Kings story unfolds. In his acclaimed 1999 memoir Places Left Unfinished at the Time of Creation, John Phillip Santos told the story of one Mexican family- his father's-set within the larger story of Mexico itself. In this beautifully written new book, he tells of how another family-this time, his mother's-erased and forgot over time their ancient origins in Spain. Every family has a forgotten tale of where it came from. Who is driven to tell it and why? Weaving together a highly original mix of autobiography, conquest history, elegy, travel, family remembrance, and time travelling narration, Santos offers an unforgettable testimony to this calling and describes a lifelong quest to find the missing chronicle of his mother's family, one that takes him to various locations in South Texas and Mexico, to New York City, to Spain, and ultimately to the Middle East. Blending genres brilliantly, Santos raises profound questions about whether we can ever find our true homeland and what we can learn from our treasured, shared cultural legacies. John Phillip Santos is the author of Places Left Unfinished at the Time of Creation, a finalist for the National Book Award. His articles on Latino art, culture, and politics have appeared in The New York Times and Los Angeles Times. A former writer and produced of television documentaries for CBS and PBS, he is also a poet and the recipient of numerous literary awards. 31-year-old Nancy Trejos was supposed to be an expert on handling her money - after all, she's the personal finance columnist for one of the nation's leading newspapers, The Washington Post. But a few months ago, she found herself in her own dire financial straits. Faced with a mountain of bills, debt, and no way to pay her rent, she was forced to call her parents to ask them for a loan. That night was a wake-up call - she vowed to get herself out of debt and into financial solvency. In Hot Broke Messes, Trejos takes readers along with her on her journey. She meets with a financial planner and a therapist to deal with all the issues young people face today - from credit card debt and student loans, to impulse buying and emotional spending, to the cost of having a social life, to buying a house with someone during a potentially impermanent relationship and more. Trejos learns what causes these problems in herself, how she can fix them, and how she can pass that advice on to other young people going through the same experiences. Even better, she shows readers how they can address these problems without completely giving up their lives - no "give up your latte a day" type advice here! Trejos' personal and unique voice, along with her experiences that everyone can relate to, will lead readers to relatively painless financial security. "Walking on Eggshells" is a 24-minute documentary about appropriation, creative influence, re-use and intellectual property in the remix age. It is a conversation among various musicians, visual artists, writers and lawyers, all sharing their views on why and how we use and create culture, and how intellectual property law, originally designed to provide people with incentives to create, sometimes hinders creative production far more than it enhances it. Being Latino in the Americas can mean very different things – depending upon where your ancestors called home, a new study led by a Cornell researcher shows. The new study shows that populations geographically close to former slave trade routes and ports have more African ancestry than more inland Latin Americans, who show more Native American heritage. “These Latino populations tell us about the complexity of migration events involved in the histories of Hispanics/Latinos,” Bryc says. The study includes genetic samples from 112 people from Mexico plus 100 individuals from Ecuador, Colombia, the Dominican Republic and Puerto Rico. The analysis shows that individuals from the Dominican Republic, Puerto Rico and Colombia have more African ancestry, reflecting migrations along the historical slave-trade routes. In contrast, Mexicans and Ecuadorians have more Native American ancestry. Researchers also found that the Native American segments of genomes of North American Latinos – those from Mexico, Puerto Rico and Dominican Republic – are genetically more similar to those of the Nahua people indigenous of Mexico and Central America, while the Native American segments of genomes of South American populations – those from Colombia and Ecuador – were most similar to those of the Quechua people. The findings also have implications for medicine, where knowledge of ancestries may reveal tendencies toward chronic inherited diseases. For example, previous studies have shown that Latinos with greater European ancestry have a higher risk of breast cancer. The genetics study by researchers from Cornell, the New York University School of Medicine, the University of Arizona and Stanford University, appears online in the May 5 edition of the peer-reviewed Proceedings of the National Academy of Sciences and can be found online at www.pnas.org. Don't miss the Latino Books Month Live Chat tomorrow at 2:30 PM ET hosted by yours truly on Blogtalkradio.com. If she tries, Gabriela can almost remember when her father went off to work . . . when her mother wasn't struggling to undo the damage he caused . . . when a short temper didn't lead to physical violence. But Gabi cannot live in the past, not when one more outburst could jeopardize her family's future. So she trades the life of a normal Miami teenager for a career of carefully managing her father's delusions and guarding her mother's secrets. As Gabi navigates her family's twisting path of lies and revelations, relationships and loss, she finds moments of happiness in unexpected places. Ultimately Gabi must discover the strength she needs to choose what's right for her: serving her parents or a future of her own. - May is Latino Books Month!You can download a copy of the summer recommended reading list for 2010 to celebrate latino writers all year long. - I am not going to lie (I have always tried to stay away from the Apple kool-aid but...), I want an ipad. Though not like Mariah Carey's blinged out one. - NYC: www.LationoBaseBall.com will award 40 outstanding Hispanic students during the 22nd Annual Hispanic Achievement Awards who have demonstrated above average scholastic ability, citizenship, leadership and promise for the future during an on-field ceremony at Yankee Stadium on Sunday, May 30th at 1:00PM. - The Countdown to Summer 2010 is on and The Fresh Air Fund is in need of host families. If you or someone you know is able to host, please sign up now. - Hotguysreadingbooks: I thought this site was pretty nifty until my friend pointed out the lack of Asian, African American and Latino men on the site. We need to start submitting photos! - Sometimes copy editors slip up: Error in Oxford English Dictionary definition goes unnoticed for 99 years. - This is late but the commentary here is great...and reiterates that sometimes social media connections/communications just don't cut it: Keep Your Mother’s Day Greetings Offline. - Speaking of the Wizard of Oz, here's the backstory of L. Frank Baum’s Tin Woodsman: Watch Heartless. - One girl, one dress, one year: www.theuniformproject.com. Adorable! - Slightly reminiscent of Kindle ads, “Get Back In Your Book” by Lissy Laricchia,is series of photos where different fairy tale characters getting sucked into their respective titles. - Would Borges have been a Wikipedia fan? - Did you watch HBO's documentary, Sergio? - "The New York Public Library launched a new awareness campaign called Don't Close the Book to fight a proposed thirty-seven-million-dollar budget cut." - "In February, the New York Times reported on the travails of blind poet Tato Laviera, who had suddenly found himself homeless in New York City after some economic and health troubles. Thanks to help from various politicians and activists, Laviera now has "a bright studio in East Harlem's Taino Towers" to call home." Jean-Pierre Jeunet, the man behind Amelie and The City of the Lost Children, brings us a new slice of kookiness in MicMacs.